I spent my summer working for Jablonski Building Conservation, gaining hands-on experience in conservation under practicing architectural conservators. Working with Adjunct Professors Mary Jablonski and Helen Thomas-Haney, and the fantastic HP Alum at JBC, I had the opportunity to work on an incredible variety of projects. 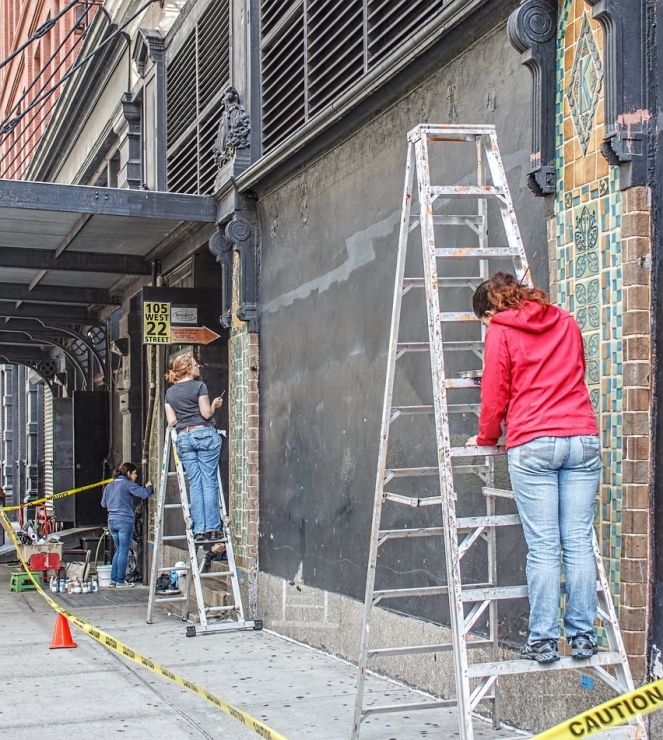 One of the first projects this summer was a tile column restoration at the Burlington Coat Factory building on Sixth Avenue, a contributing building to the Ladies Mile Historic District. 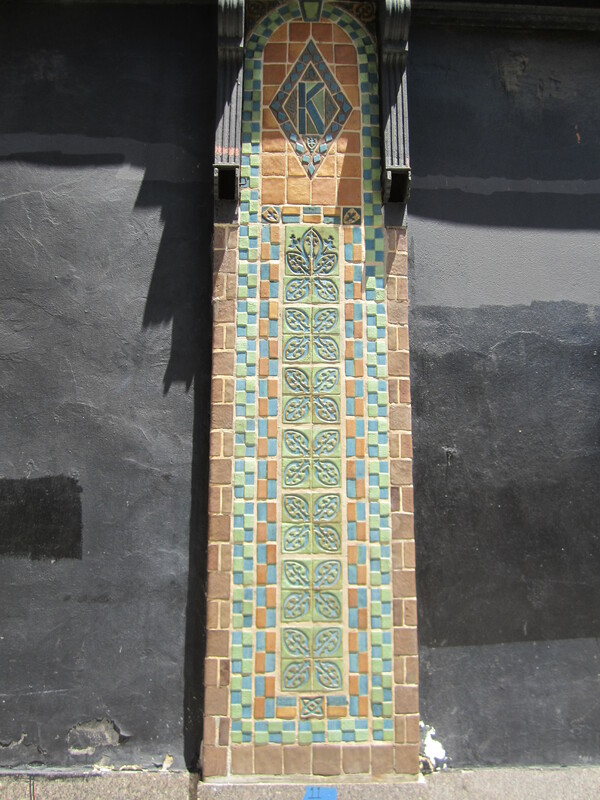 The tiles were installed between 1911 and 1913, making them over 100 years old. They were manufactured by the Hartford Faience Company for Chicago businessman J.L. Kesner, who planned to lease the building, but withdrew in late 1913. Nine of the original columns survive, in varying conditions. Some of the tiles were a bit worse off than others, some were missing, and other covered in paint. The first step was to complete cleaning tests to determine the most effective and mild cleaners. Over several weeks the columns were cleaned and graffiti, gum, and paint residues were carefully removed. Once this was complete, anchors from decades of abandoned signage systems were removed, and patching commenced. Using a system from Edison Coatings, and custom glaze matches, damaged tiles were patched, sanded, and in-painted. During this time, we were asked every day about our work by passersby. Many told us that they had walked by the building every day for the past several years and couldn’t believe they’d never noticed the tiles until we cleaned them! They were covered in so much dirt and grime, it isn’t too surprising that they were lost in the hustle and bustle of Sixth Avenue. 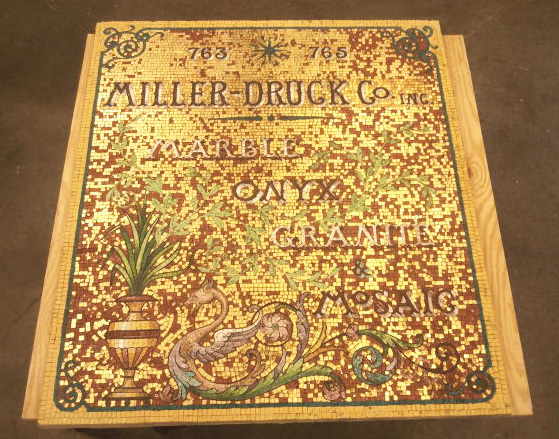 Miller-Druck Specialty had this gem removed from their original Manhattan warehouse site, where it served as an outdoor advertisement for the company and its goods for over 60 years. 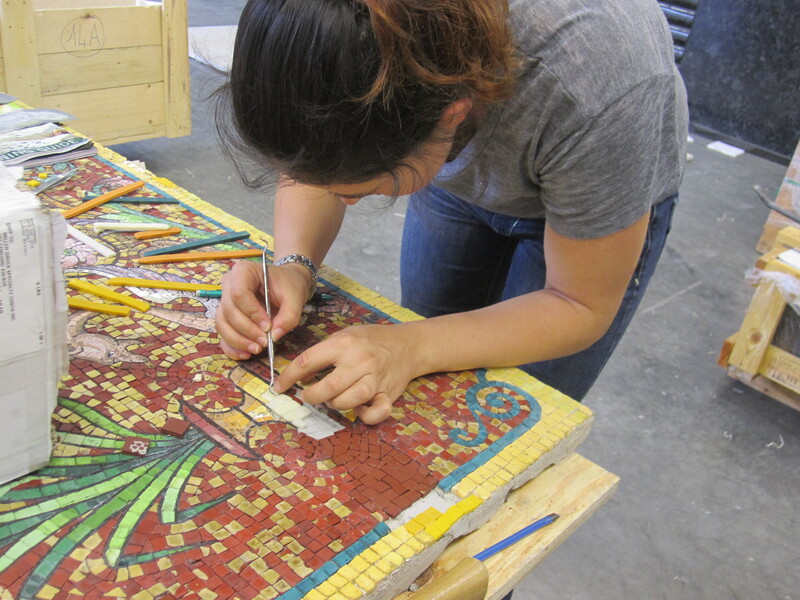 Having decided that it was worth conserving for display at their new location, JBC was hired to clean and repair the mosaic and to reconstruct a missing section of tiles. Thanks to a lot of hard work and the support of Miller-Druck’s owner and employees, the mosaic is once again ready to bring in business. These projects are just a small piece of the summer, which was also filled with, among many other things, materials tests, cleaning tests for a private residence, several research projects on specific architectural elements found in early 20th century New York structures and the construction history of a prestigious educational facility in the Northeast, and formulation of historic paints for a house museum in New England. For those of you familiar with my obsession with coatings, both historic and modern, this was a special treat. Working alongside recent Columbia HP grad, Alafia Akhtar, we formulated lime washes and distempers using historic recipes, and adding modern pigments in order to match a historic finish. After hours of testing dilutions and color matching, several batches were made ready and tested, with more work to come. This internship has been an incredible experience, I have learned so much from the amazing ladies of JBC, and I look forward to continuing to learn from them through the coming semester.